Slab walnut and maple custom buffet. Diane Paparo Associates. Walnut slab custom bed headboard and foot board. This unique custom bed has a story to tell. Size Queen. Unique rustic walnut slab headboard and footboard. The walnut in this bed came from a farmhouse in Humbolt, Nebraska. The tree was sawn in the fall of 1968 and sat in the barn for over 25 years before the wood came into my hands. 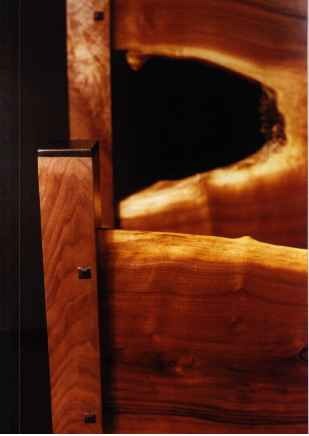 For 5 years I thought of a way I could use these beautiful pieces of crotch walnut without losing the beauty of the sapwood. Finally this design came to me after much thought. Mortise and Tenon joinery with hickory pins capped with ebony and ebony caps on each post. (see close-up). Close up of the beautiful unique rustic walnut slab headboard and footboard. The 2″ thick highly, figured Claro walnut slab is suspended on 3″ above the solid curly maple cabinet by 3/4″ rebar. The beautiful dovetail corners of the cabinet show off the skill of the artist. Size 10′ L x 40″ H x 20″ D.